Wherever you are. Wherever you go. In the city or in the open road. In winter or in summer. The VALIANT is such a versatile helmet that will become part of your "go to kit" because it's doubly certified as a Full face and a Open Face helmet. An unbelievable price. A low weight 1700 gr. What more could you ask for? A 180 degree swing-around chin bar. 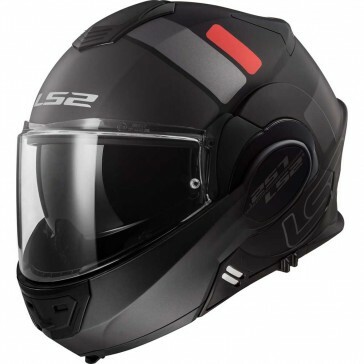 Excellent lateral visibility and so comfortable you'll forget you're wearing it. LS2 helmets feature a Dynamic Flow­through Ventilation. Fully adjustable intake ports and vented EPS work with the rear spoiler and exhaust ports to create a constant, light flow of air helping to keep the rider cool and comfortable.